- Wal-mart- Hellboy Animated Digest Volume 2 as an on-pack bundle with Blood and Iron. - Transworld (Suncoast / FYE / Sam Goody)- Special 64 page book featuring material from Hellboy Weird Tales. The book is called Hellboy The Theater of the Dead and Other Stories. This will also be an on-pack bundle. - Lobster Johnson sculpted magnet. This is a DVD gift with purchase at multiple retailers across the US. This is in addition to the mini-comic inserted into all the DVDs. Plus Best Buy will have another sculpt promotion but something bigger than their Bust-Ups promotion. And if you're buying multiple copies to get the extras and then returning the DVDs, I don't want to hear about it. Reports of DVD returns do nothing to help the production of Phantom Claw. Quite the opposite. Consider giving them as gifts or a library donation. Normally I'd just add this as a second post but it fits the topic so well. 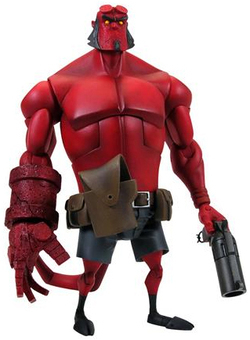 The Best Buy premium will be the full-sized Hellboy action figure! The release had to be postponed to get the toy shipments in from overseas. So I would think this will make for pretty impressive sales in those stores. Good thing I got the comics to keep me entertained in the meantime. Feel for you, hb. But your salvation is drawing nigh. I don't know which promo to go with. I will have to wait and see what Best Buy comes up with. I'm in for the Bestbuy exclusive and whatever retailer has the LoJo magnet.Yes, I buy 2 copies and pass on the other to my buddy.like I did last time,Now he's hooked on Hellboy...cool thing is...the animated movies are what got him interested...the circle just gets bigger and bigger.Thanks Tad! 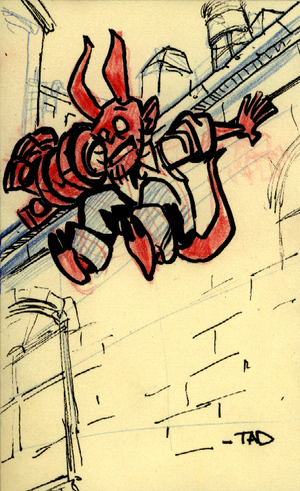 Question...will this dvd have the random Mignola sketches? An LJ magnet? I'm in! Not that I wouldn't be anyway. Everyone needs to buy at least two of the DVDs (give one to a friend) so the third one can be made! I have a Randy Bowen sculpted HB fridge magnet and he needs a buddy to hang out with. Well, Best Buy it is then! Thanks for the update, Tad. aha...you let the cat out of the bag with the Bestbuy exclusive....yeah I am so getting one of my copies from ther or maybe two ,so my son can have one.